Recently, the Verizon 2015 Data Breach Investigations Report (DBIR) was released to much fanfare as usual, prompting a variety of media outlets to analyze the analysis. A few days after the release, I caught a Tweet linking to a blog from @raesene (Rory McCune) that challenged one aspect of the report. On page 16 of the report, Verizon lists the top 10 CVE ID exploited. The bottom of the table says “Top 10 CVEs Exploited” which can be interpreted many ways. 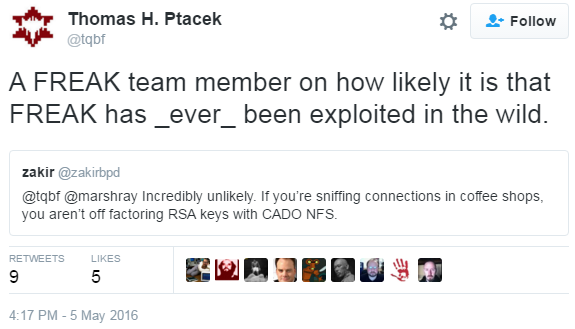 The paragraph above qualifies it as the “ten CVEs account for almost 97% of the exploits observed in 2014“. This is problematic because neither fully explains what that means. Is this the top 10 detected from sensors around the world? Meaning the exploits were launched and detected, with no indication if they were successful? Or does this mean these are the top ten exploits that were launched and resulted in a successful compromise of some form? This gets more confusing when you read McCune’s blog that lists out what those ten CVE correspond to. I’ll get to the one that drew his attention, but will start with a different one. CVE-1999-0517 is an identifier for “an SNMP community name is the default (e.g. public), null, or missing.” This is very curious CVE identifier related to SNMP as it is specific to a default string. Any device that has a default community name, but does not allow remote manipulation is a rather trivial information disclosure vulnerability. This begins to speak to what the chart means, as “exploit” is being used in a broad fashion and does not track to the usage many in our industry associate with it. McCune goes on to point another on their list, CVE-2001-0540 which is an identifier for a “memory leak in Terminal servers in Windows NT and Windows 2000 allows remote attackers to cause a denial of service (memory exhaustion) via a large number of malformed Remote Desktop Protocol (RDP) requests to port 3389“. This is considerably more specific, giving us affected operating systems and the ultimate impact; a denial of service. This brings us back to why this section is in the report when part (or all) of it has nothing to do with actual breaches. After these two, McCune points out numerous other issues that directly challenge how this data was generated. Since Verizon does not explain their methodology in generating these numbers, we’re left with our best guesses and a small attempt at an explanation via Twitter, that leads to as many questions as answers. You can read the full Twitter chat between @raesene, @vzdbir, and @mroytman (RiskIO Data Scientist who provided the data to generate this section of the report). The two pages of ‘methodology’ Verizon provides in the report (pages 59-60) are too high-level to be useful for the section mentioned above. Even after the conversation, the ‘top 10 exploited’ is still highly suspicious and does not seem accurate. The final bit from Roytman may make sense in RiskIO’s world, but doesn’t to others in the vulnerability world. The best example of this problem is CVE-2002-1931 which gets listed at number nine. This is a Cross-Site Scripting issue in version 2.1.1 and 1.1.3 of a product called PHP Arena and specifically the pafileDB area of that product. Now I struggled to find out too much about that product because the site that used to host it http://www.phparena.net is now a gambling site (I presume that the domain name lapsed and was picked up as it got decent traffic). Searching via google for information, most of the results seemed to be from vulnerability databases(!) and using a google dork of inurl:pafiledb shows a total of 156 results, which seems low for one of the most exploited issues on the Internet. Going back to this script being ‘more complex’, and to try to answer some questions about the disclosure, the next trick was to find a copy of paFileDB 3.1 or before to see what it entailed. This is harder than it sounds, given the age of the software and the fact the vendor site has been gone for seven years or more. With the archive finally in hand, it became more clear what the various ‘action’ parameters really meant. We know it is “pafiledb.php” only because that is the base script that in turn calls others. In reality, based on the other digging, it is very likely making a call to includes/search.php which contains the vulnerability. Without performing a code-level analysis, we can only include a technical note with our submission and move on. Continuing the train of thought, what data collection methods are being performed that assign that CVE to an attack that does not appear to be publicly disclosed? The vulnerability scanners from around that time, many of which are still used today, do not specifically test for and exploit that issue. 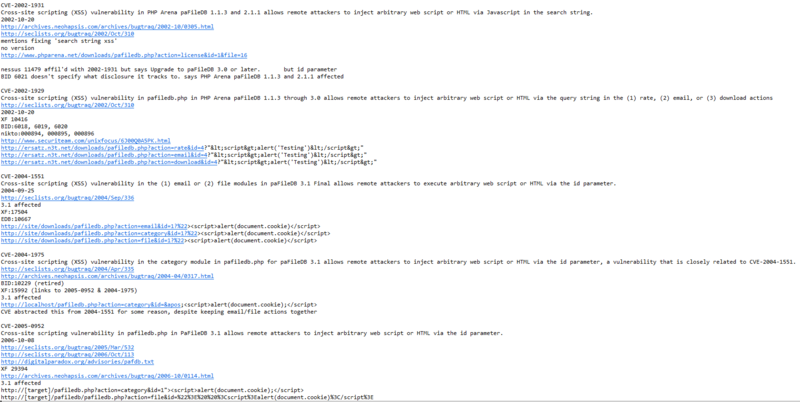 Rather, they look for the additional three XSS disclosed in the same post further down. 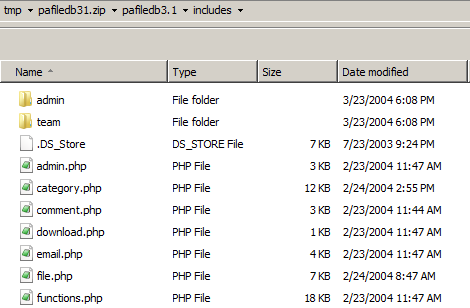 All three “pafiledb.php” exploits that call a specific action that correspond to /includes/rate.php, /includes/download.php, and /includes/email.php. It is logical that intrusion detection systems and vulnerability scanners would be looking for those three issues (likely lumped into one ID), but not the vague “search string” issue. McCune’s observation and singling this vulnerability out is spot on. While he questioned the data in a different way, my method gives additional evidence that the ‘top 10’ is built on faulty data at best. I hope that this blog is both educational from the VDB side of things, and further encourages Verizon to be more forthcoming with their methodology for this data. As it stands, it simply isn’t trustworthy.